The Dragon Spacecraft Qualification Unit was a boilerplate version of the Dragon spacecraft manufactured by SpaceX. After using it for ground tests to rate Dragon's shape and mass in various tests, SpaceX launched it into low Earth orbit on the maiden flight of the Falcon 9 rocket, on June 4, 2010. SpaceX used the launch to evaluate the aerodynamic conditions on the spacecraft and performance of the carrier rocket in a real-world launch scenario, ahead of Dragon flights for NASA under the Commercial Orbital Transportation Services program. The spacecraft orbited the Earth over 300 times before decaying from orbit and reentering the atmosphere on 29 June. In September 2009, the launch was slated to occur no earlier than November 29, 2009, however the launch was subsequently postponed ten more times, to launch dates in February, March, April, May, and June 2010, for multiple reasons including finding an open launch date, approvals, and retesting. The launch date was eventually set for June 4, 2010. On October 16, 2009, the nine Merlin engines of the first stage of the Falcon 9 rocket intended to launch the DSQU were test fired at SpaceX's rocket engine test facility in McGregor, Texas. On January 2, 2010, the second stage of the Falcon 9 vehicle was test fired for the full duration required for orbital insertion, 345 seconds. By late February, the launch vehicle had been assembled and raised to its vertical position on the launch pad at Cape Canaveral Air Force Station Space Launch Complex 40 (SLC-40), having been rolled out to the launch pad on February 19. On March 13, 2010, the first stage engines successfully underwent a 3.5 second static test firing, having failed a previous attempt the day before. The Dragon boilerplate launches aboard Falcon 9 Flight 1, June 4, 2010. SpaceX announced in September 2009 that the Dragon Spacecraft Qualification Unit would be the payload for the first Falcon 9 launch. At the time, launch was scheduled to occur no earlier than November 2009. The launch date had been delayed several times for various reasons, The spacecraft was launched and entered orbit on June 4, 2010. The first actual launch attempt targeted a four-hour launch window opening at 15:00 UTC (11 a.m. EDT) on 4 June 2010, with the possibility of a launch attempt the following day in the event that launch did not occur inside the 4 June window. The first attempt to launch the rocket, at 17:30 UTC, was aborted seconds prior to liftoff due to a reported out of range engine parameter, which later turned out to be a sensor error. The launch was rescheduled, with a successful liftoff taking place an hour and fifteen minutes later at 18:45 UTC (2:45 pm EDT). The vehicle reached orbit successfully, entering into a 250 km orbit. 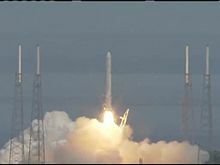 The rocket experienced "a little bit of roll at liftoff" as Ken Bowersox from SpaceX put it. This roll had stopped prior to the craft reaching the top of the lightning towers. A separate issue involved a moderate, uncorrected roll at the end of the second stage firing. The first stage, that is designed to be reusable, was destroyed on impact in the Atlantic Ocean (32°07′00″N 69°15′00″W﻿ / ﻿32.116667°N 69.25°W﻿ / 32.116667; -69.25) when its parachute malfunctioned. Following the launch, SpaceX left the qualification unit in low Earth orbit, where its orbit was allowed to decay and it reentered the atmosphere around 0050 GMT on June 27, 2010. The qualification unit remained attached to the second stage of the launcher; production units separate for orbital maneuvering. SpaceX lost contact with the DSQU and the Falcon 9 second stage shortly after orbit was achieved, as the on-board batteries were only designed to last long enough to launch. They re-entered in the early morning hours (UTC) on June 27, 2010. Although exact location is uncertain, it is believed to have disintegrated over Syria and Iraq. Australia. The orbit took the vehicle from west to east at around sunrise. Sightings were from Canberra and the New South Wales south coast to north of Brisbane. At around 5:30 am local time on June 5, 2010, sightings of a mysterious "lollipop-type swirl" light or cloud heading from west to east were reported in the Australian states of New South Wales and Queensland, as well as the Australian Capital Territory. The sightings were likened to the Russian RSM-56 Bulava rocket launch that prompted similar video and images from the Arctic known as the 2009 Norwegian spiral anomaly; it was suggested that the visible object was the spent upper stage and/or Dragon prototype launched aboard the Falcon 9. ^ a b "Dragon/Falcon 9 rocket - Orbit". ^ a b c "Falxon 9 Launch report". Archived from the original on June 5, 2010. Retrieved 2010-06-04. ^ "Private Falcon 9 Rocket Meets Fiery End After 3 Weeks in Space". Space.com. Retrieved 2012-06-02. ^ Block, Robert (September 22, 2009). "Air Force: SpaceX's Falcon 9 first launch planned for Nov 29". Orlando Sentinel. Archived from the original on March 21, 2010. Retrieved January 11, 2010. Cape Canaveral – After being removed from the U.S. Air Force's 45th Space Wing's launch schedule for five months, SpaceX's Falcon 9 rocket is back on the board. The most recent 90-day Eastern Range forecast released Tuesday has the new rocket's maiden launch planned for November 29 at 11 am local time. ^ "Falcon Launch Report – Mission Status Center". Spaceflight Now. June 2, 2010. Archived from the original on June 4, 2010. Retrieved June 4, 2010. ^ Atkinson, Nancy (February 22, 2010). "Photo Gallery: Falcon 9 Now Vertical on the Launchpad". Universe Today. Retrieved February 25, 2010. Over the weekend, SpaceX rolled their Falcon 9 launch vehicle out to the launchpad at Space Launch Complex 40, Cape Canaveral. ^ "Falcon 9 Flight 1 rollout". SpaceX. February 19, 2010. Retrieved March 15, 2010. ^ Malik, Tariq (March 15, 2010). "SpaceX Successfully Tests New Rocket's Engines at Launch Pad". Space.com. Retrieved March 15, 2010. ^ Halvorson, Todd (March 12, 2010). "For SpaceX, a 'lesson learned' from valve failure". Florida Today. p. A.1. Retrieved October 17, 2010. ^ van Leeuwen, Marcel (2009-09-24). "SpaceX DRAGON/FALCON 9 UPDATE". AviationNews.eu. Retrieved 2010-01-12. ^ "SpaceX Achieves Orbital Bullseye With Inaugural Flight of Falcon 9 Rocket: A major win for NASA's plan to use commercial rockets for astronaut transport". SpaceX. 7 June 2010. ^ Kaplan, Jeremy (June 4, 2010). "SpaceX Falcon 9 Rocket Launches, Despite Snags and Delays". Fox News. Retrieved 2010-06-05. ^ Staff writer (June 4, 2010). "SpaceX Falcon 9 rocket enjoys successful maiden flight". BBC News. Retrieved 2010-06-05. ^ Staff writer (June 4, 2010). "SpaceX Falcon 9 rocket launches". CNN. Retrieved 2010-06-05. ^ "Interview with Ken Bowersox from SpaceX". Youtube.com. Retrieved 2012-06-02. ^ Cowing, Keith. "Falcon 9 Nails Orbit – First Stage Slams Hard into Atlantic". nasawatch.com. NASA Watch. Retrieved 9 June 2010. ^ Boyle, Alan (June 4, 2010). "Shuttle successor succeeds in first test flight". MSNBC. Retrieved 2010-06-05. ^ a b Clark, Stephen. "Falcon rocket meets fiery end after three weeks in orbit". ^ "SpaceX – Updates". SpaceX. ^ "UFO spotted over eastern Australia". ABC Online. June 5, 2010. Retrieved June 5, 2010. Klamper, Amy (2009-09-24). "SpaceX Says Dragon Prototype Will Fly on First Falcon 9". Space News. Wikimedia Commons has media related to Falcon 9 Flight 1. This page was last edited on 3 September 2018, at 10:46 (UTC).